One of the most comfortable and easiest hoverboards to ride. The off-road experience is unbelievable and you can run on dirt tracks with ease. We tested it on a course in the woods for bicycles and it ran over sticks and smaller stones without a single problem. One of the most fun hoverboards to ride and perfect for those who doesn't only want to ride it in the city. Large, 10 inch inflatable tires is perfect for any terrain, much like having a set of bicycle wheels, so it’s usable on dirt, grass, etc. The max 30 degree inclined plane climbing capacity lets you climb on steeper surfaces with no problem and less usage on the battery. LED lights can cast up to 6.5 feet of light in both directions, which is perfect for riding at night. Great speed at 11.2 mph and powerful set of motors. Perfect for smooth and steady videos due to its stable riding feel. Very quiet – makes minimal noise as you ride on it. It’s got a sleek carbon fiber finish. Big upgrade from 6.5 or 8 inch wheels. Slightly pricier than most hoverboards. Charging time is slightly longer than other boards, although its power against steeped surfaces is unquestionable. For those who like big wheels, the StabilitySaw Hoverboard is one decent and sleek board you’d want to use, especially over rough terrain such as dirt, grass, etc. Its inflatable wheels provides a really comfortable ride and it gives this hoverboard superior qualities in taking on obstacles and though terrain. 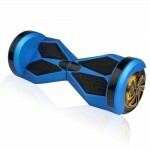 This is the board to use if you plan to roam the streets at night and need big wheels and efficient LED lights. In our opinion its the best that StreetSaw has to offer even though the Futuresaw is pretty darn good looking. Ride smoothly and steadily with the StabilitySaw Hoverboard which is perfect for taking that perfect video while balancing with almost noise-free engine from below your feet. You can easily go over rough obstacles and small rocks along the way without problems due to its big set of 10 inch wheels. This rugged hoverboard was meant to be taken off the road and into the rougher side of the Earth. Its 10 inch wheels are designed to conquer big and rough terrain and its LED lights shining up to 6.5 feet of light helps keep things visible at night. It has a rather fast but fairly safe speed of 11.2 miles per hour – perfect for taking it along the road and off the road. With over 5 to 6 hours of battery time, you can enjoy more riding in style and in speed. It might have to be charged significantly longer than smaller boards (2 to 3 hours), but it will be all worth the while since this can really push against steep terrain and surfaces. What makes the StabilitySaw an Awesome Hoverboard? 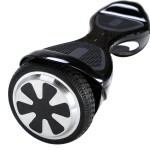 It is the perfect off-road hoverboard to use with its set of 10 inch wheels, powerful 350 x 2 motors, long battery life, sturdy and sleek carbon fiber finish (or choose from the other designs) and shock protected tires to help heavier riders to balanced on the board without a problem.